I loved Seis Lagos so much I bought a home there. As a Realtor® I show homes and communities all over Collin County to my clients so I’ve seen and been in more communities then most people will ever see. The first time I came to Seis Lagos I recognized immediately it is a unique community and was where I wanted to live. 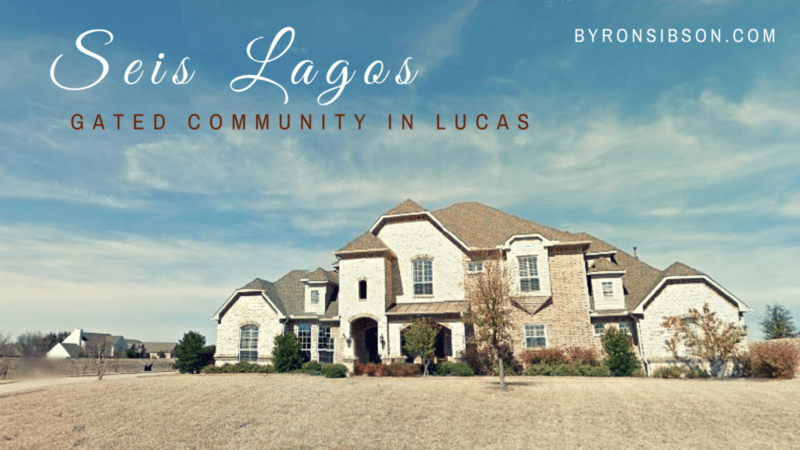 Seis Lagos is an upscale community in Lucas Texas located just off Country Club road. There is a country feel to it as many of the surrounding homes are on 1 acre plus lots. It has a gated entry with 24-hour manned security. There are six beautiful lakes within the community hence it’s name Seis Lagos, which means six lakes in Spanish and all the lakes are stocked so there’s great fishing. Seis Lagos is located in two cities, Lucas and Wylie and in two Independent School Districts Lovejoy and Wylie. The border runs pretty well through the middle of the community. The Lovejoy ISD is a big draw for many families as Lovejoy ISD is ranked #2 in the State of Texas for academic readiness (STAAR) exams. Seis Lagos consists of 450 homes on a half acre to 1 acre lots many homes are custom built. When you enter the community it has a very open park-like feeling to it the homes set well back from the street. There are loads of mature trees and wood fences are not permitted so you’re not looking at a bunch of ugly fences. Seis Lagos offers great amenities; we have a 7,200 square foot clubhouse with a full-sized commercial kitchen that can accommodate events for up to 200 people and it is available to the residents of Seis Lagos free of charge. The Clubhouse also has a workout room with new equipment, pool table and shuffleboard, and card room. Other amenities include a lap pool, a kiddie pool, and an adult pool, there are two tennis courts with lights, two large sports courts, and a playground. Two of the lakes feature floating docks with cabanas. The HOA employs a full-time HOA manager and there is a full schedule of events all year long, like the July 4th celebration and parade, annual fishing derby, the kids Halloween party and the annual parking lot sale. One of the most popular amenities for residents is the gated entry with its 24 hours manned security. All residents are provided with a Seis Lagos resident sticker for their front windshield. Residents are waved through by the security guard and all visitors must stop and provide their name and license plate number and who they are visiting before they are let into the community. This amenity provides an additional level of security and peace of mind especially when you’re out of town. Another unique feature of Seis Lagos is many people have golf carts that they use to get around within the community the kids especially like this to get to the pool and the lakes. If Seis Lagos seems like a neighborhood you’d like to be a part of, give me a call! I’d love to show you around “my” community and offer more information and driving tours of the properties and interior tours of the homes. Call me today for all Collin County real estate.